By Dorothy Justus Sluss, Ph. D.
Dimensions 0.75 by 8.25 by 10.75 in. 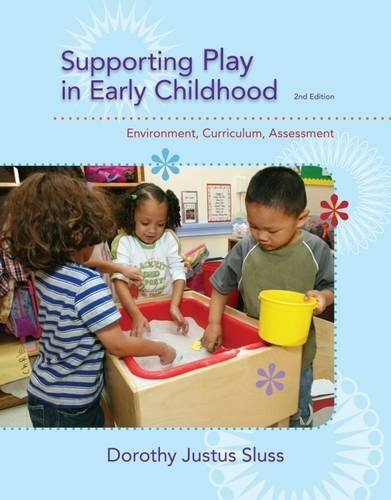 Amazon.com description: Product Description: Aimed at teachers and future teachers of children from birth through age eight, this book examines the positive effects of play on children's social/emotional, cognitive, and physical development. You will learn how to assess a child's learning through play, making play a more practicable teaching mechanism. You also will learn step-by-step recommendations for establishing a classroom that promotes play and how to develop play-based programs for children in specific age groups: infants and toddlers, preschoolers, kindergarten children, and primary-age children. Incorporating play into the program of special needs children is addressed in each age-specific section and in a separate chapter. About: Aimed at teachers and future teachers of children from birth through age eight, this book examines the positive effects of play on children's social/emotional, cognitive, and physical development.